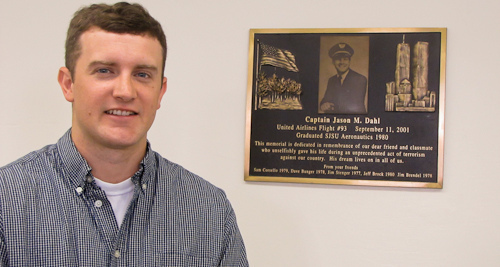 Below a flag signed by his family and a plaque bearing his likeness, students, faculty and staff remember Jason Dahl, alumnus and captain of UA 93 (Department of Aviation and Technology photo). 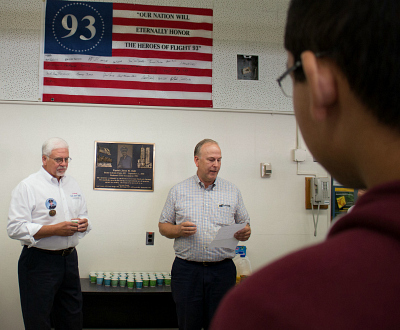 At 10:14 a.m. Sept. 11, as they have done for the past 13 years, the students, faculty and staff of San Jose State’s aviation program paused for a moment of silence in memory of Jason Dahl, ’80 Aeronautics Operations. Dahl was the captain of United Airlines Flight 93, which terrorists crashed into the Pennsylvania countryside at 10:14 a.m. Sept. 11, 2001. He began taking flying lessons before he was old enough to drive, and was the first in his family to graduate from college. “His entire life was about milestones…He was really proud to be a Spartan,” said Dahl’s brother-in-law, Bill Heindrich, who attended the event, held in the Industrial Sciences building, home to the Department of Aviation and Technology. This year, in Shanksville, Pa., a Congressional Gold Medal was awarded to the 40 passengers and crew members who died aboard UA 93. Meanwhile, at SJSU, Dahl’s legacy lives on. The Captain Jason Dahl Scholarship Fund makes a gift to one San Jose State student annually. As intimate and solemn as ever, this year’s event remembered Dahl with a traditional toast for pilots who lose their lives in the line of duty. Sitting atop a yellow grassy hill, Pajaro Valley High School overlooks the Watsonville State Wildlife Area and a series of sloughs that make up the area’s wetlands. Watsonville, located about a half hour northeast of Monterey, is a community known for agriculture. Farms rely on the Pajaro River, which flows into Monterey Bay. To teach high school students about their natural surroundings, Sonya Sankaran, ’12 M.S. Marine Science, works as a senior bilingual education specialist for the Monterey Bay Aquarium. While attending graduate school at Moss Landing Marine Laboratories (MLML), she began volunteering with the aquarium and later found out about this opportunity. SJSU is the administrator of Moss Landing Marine Laboratories, the home of the master’s of marine science program for seven California State Universities. Thanks to her education, Sankaran is able to connect her students with the right experts for their research projects. “Working at Moss Landing opened innumerable doors for me, which has allowed me to open doors for our students,” she said. Her specific teen program with the aquarium, Watsonville Area Teens Conserving Habitats (W.A.T.C.H. ), is a year-round elective science course offered by Pajaro Valley High School and Watsonville High School. For two weeks over the summer, students learn more about the Pajaro River Watershed from a combination of high school teachers, scientists and W.A.T.C.H. staff as preparation for their year-long school projects. Students have investigated the effects of non-native species on native species, ocean acidification and phytotoxins at a local lake. Sankaran and her W.A.T.C.H. colleague Enrique Melgoza started their jobs together in April 2012. They are both fluent in Spanish, a useful skill since most of the students in the program come from Spanish-speaking households. Melgoza, ’08 Aviation Management, was raised in Watsonville and said he can relate to their students. They teach their students to do field work, such as gathering samples and using a water quality testing kit that wirelessly connects with an iPad app. Sankaran’s favorite part of her job is giving her students the opportunity to study and connect with the outdoor environment, especially the ocean. A snapshot from the 1960s, when Aerocrash was held in Santa Cruz (Glynn Falcon image). 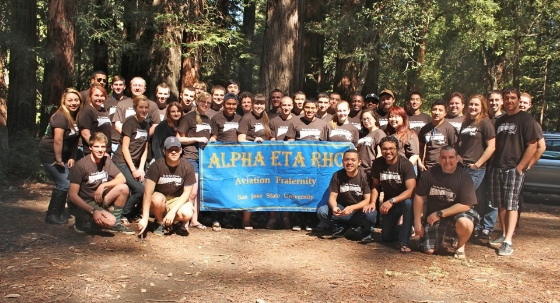 Alpha Eta Rho, the business fraternity for aviation majors, hosted its 65th annual Aerocrash April 21-22 as a way to celebrate graduation and connect alumni to new members. Students in SJSU’s aviation program prepare for careers in aviation management, avionics, maintenance management, operations and professional flying. The two-day annual alumni camping trip and barbecue took place at Big Basin State Park in Santa Cruz. Approximately 45 participants gathered in the redwoods state park and rallied up a good time through camping and outdoor sports. Carly Smith, aviation operations ’10, was one of 10 alumni present. The weekend concluded with an alumni barbecue, providing another opportunity for current members to network with alums in the aviation field. For Glynn Falcon, adjunct professor, Alpha Eta Rho adviser and an aviation alum who graduated in 1971, the annual weekend offers a chance for alumni to show appreciation and be a part of SJSU aviation history. Long before Jason Dahl became known as the heroic pilot of United Airlines Flight 93, which crashed into a rural Pennsylvania field on 9/11, he was launching his career in Fresno. Dahl moved here for his first job, got married, had his first child and bought his first home. His first boss and a friend from his north Fresno neighborhood talk today about his love of flying, quick wit and how he was living his dream as a United pilot. The heroism shown by Dahl and others on Flight 93 – including former Fresno State student Todd Beamer, whose call to action, “Let’s roll,” became a rallying cry for Americans – has been the subject of at least five movies. In 1979, Dahl was 22, fresh out of San Jose State with a commercial pilot’s license in hand and knocking on the door at Nelson’s construction company, which Nelson later shut down. Dahl’s résumé was impressive. He flew solo at 16 and earned his pilot’s license before he could drive, friends said. In Dahl’s job interview, Nelson quickly realized he was in the presence of an aeronautical prodigy. Nelson hired Dahl to fly the company jet to appointments in the Bay Area and Los Angeles. Dahl helped expand Nelson’s business by taking passengers, equipment, freight and parcels across the western U.S.
Nelson says that Dahl’s outgoing personality attracted clients. But Dahl’s real ambition was to fly large passenger planes. “His dream was to build up enough hours and go to work for United Airlines,” Nelson says. Nelson says he believes Dahl would not have given up his plane to hijackers. He attended Dahl’s funeral in Colorado and heard many people share the same sentiments about him. In Fresno, Dahl began to experience the rites of young adulthood. He married his first wife, Gail, in 1981. He bought his first house in 1984 in a Woodward Park neighborhood. His son, Jason Matthew Dahl Jr., was born here in 1986. Today, he has a degree in physics from the University of Denver, and is in Pennsylvania this weekend for a memorial at the Flight 93 crash site. Jim Lowe, executive vice president at the advertising firm Jeffrey Scott Agency, was about the same age as Dahl and living in the same neighborhood. The two quickly became friends. They worked on making their homes nicer. Lowe recalls a landscaping project when they were helping each other dig trenches in their backyards. Lowe let Dahl maneuver the trencher onto his pickup so it could be moved to Dahl’s house a couple doors away. “I figured he was a pilot and he could handle it,” Lowe says. Dahl lost control and dented the truck. They laughed it off – but Lowe says he continued to rib Dahl about it. Lowe says he remembers sharing great times with Dahl. They went to Fresno State football games with friends, testing Dahl’s loyalty to his alma mater and conference rival San Jose State. “If you were looking for someone to be your neighbor, this is who you would pick,” Lowe says. By 9/11, they hadn’t seen each other in years – both had left the old neighborhood more than a decade earlier. Lowe says that by the next day, he realized that his former neighbor had died in the crash of Flight 93. Nelson says that it was early 1986, right about the time of Jason Jr.’s birth, that Dahl got the call from United Airlines. Dahl cried when he called Nelson with the news, saying he had to leave for Denver (a United hub) that night. It didn’t take long for Dahl to climb up the ranks at United and become a flight trainer. His brother-in-law, Bill Heiderich, a former adjunct professor at Fresno City College, says Dahl taught at United’s flight center and trained people for hostage and hijacking situations. Dahl saw changes in his family life, too. He divorced Gail, who still lives in the Denver area, and married Sandy Guy in 1996. Dahl had rearranged his schedule to fly Flight 93 on Sept. 11, 2001, so that he could be home later in the week to celebrate his fifth wedding anniversary, according to reports. There is no clear account of what happened in the moments before Flight 93 crashed. Cockpit tape recordings suggest that passengers rushed the hijackers. The plane, which the hijackers had intended to fly into either the Capitol or the White House, instead crashed in a field near Shanksville, Pa. In a 2006 interview with ABC’s “Good Morning America,” Sandy Dahl – who, along with other family members, had listened to the tapes soon after the crash – said that her husband was stabbed and that he pulled the autopilot shortly before losing consciousness. The autopilot could have placed the plane on a course that the hijackers did not want to go. She also said it sounded like he squawked the emergency frequency so that when hijackers announced there was a bomb on board and everyone should stay seated, the message got to air traffic control towers instead of passengers. Dahl or his co-pilot, LeRoy Homer, can be heard on the tape shouting “Mayday! Mayday!” and “Get out of here!” as the hijackers burst into the cockpit. Dahl is memorialized in many ways: The elementary school he attended in San Jose was renamed in his memory in 2002. A flight simulation laboratory at San Jose State was named for him, as well as a science lecture hall at Andrew Hill High School. It’s known as Dahl Hall, Heiderich says with a slight chuckle because Dahl would have appreciated it. Heiderich last saw Dahl when he came home the weekend before 9/11. It was no special occasion, and Bill and Carol Heiderich considered not going. Originally published by the San Jose Mercury News September 6, 2011. From the San Jose elementary school where he first dreamed of being a pilot to San Jose State University where he earned his aviation degree, Capt. Jason Dahl was honored Tuesday for being at the helm of the only hijacked plane on Sept. 11, 2001, that didn’t hit its intended target. Some 650 students sat in folding chairs, listened to speeches and watched a color guard on the same playground where Dahl once played in the 1960s, back when the school south of Tully Road was known as Hillsdale Elementary, before it took his name. That was the message for the students at Jason M. Dahl Elementary on Tuesday, many from poor immigrant families, to work hard to achieve their goals, like Dahl did. “All of you are capable of reaching the skies like Jason has,” U.S. Rep. Mike Honda, D-San Jose, said from the podium Tuesday. Dahl was pilot of United Airlines Flight 93 that morning 10 years ago, flying from Newark, N.J., to San Francisco when terrorists barged into the cockpit. The cockpit recording picked up Dahl or his co-pilot repeatedly yelling, “hey, get out of here!” before they were killed and the terrorists took over the controls. The rebellion on Flight 93 is considered America’s first campaign to “fight back” against terrorism. The passengers on the plane, alerted by calls to their wives on the ground that the Twin Towers had been hit and Flight 93 was likely on a suicide mission as well, staged a counterattack against the terrorists.A group charged to the front of the plane and was on the verge of breaching the cockpit when the terrorists pitched the plane into a Pennsylvania farmfield instead of losing control to the passengers. The plane likely was headed to the White House or the U.S. Capitol. As Honda put it Tuesday, the terrorists already had struck a blow to the symbol of America’s economy by hitting the Twin Towers, and the symbol of the military when another plane hit the Pentagon. Because of the heroism of Flight 93, he said, the symbols of democracy — the White House and Capitol building were spared. Three red hybrid tea rose bushes were planted Tuesday in the elementary school garden to signify “courage and strength,” Principal Maria Martinez said. Honda, a group of local pilots from United Airlines and American Airlines, and Dahl’s sisters each shoveled dirt around the bushes. In the aviation department at San Jose State, where Dahl graduated in 1980, students and faculty gathered to pay their respects to Dahl’s family, including sisters Carol Heidrick and Joan Raymundo. Tommy Ondrasek, a 28-year-old junior who received the 2010 Jason Dahl Scholarship, considers Dahl a role model. “He died doing something he loved, and that inspired me to do the same, regardless of what happened 10 years ago,” he said. Dahl’s son, Jason Matthew Dahl Jr., who is 25 now with a degree in astrophysics, will rendezvous with his aunts on Sunday during a memorial at the crash site. The pilot’s widow, Sandra Dahl, remained in Colorado on Tuesday, where a memorial is planned there. As America mourns the 10th anniversary of the 9/11 terrorist attacks, SJSU’s campus community reflects upon its own connections to the historical event. The pilot of hijacked United Airlines Flight 93 was a SJSU graduate, and his name lives on in a scholarship for aviation students. A former U.S. Army Ranger in Afghanistan becomes a University Police Department officer. And a free memorial concert and vigil this Sunday will use music to pay tribute to those who lost their lives. Tommy Ondrasek stands next to a plaque for Captain Jason Dahl, pilot of United Airlines Flight 93. Photo by Elena Polanco. 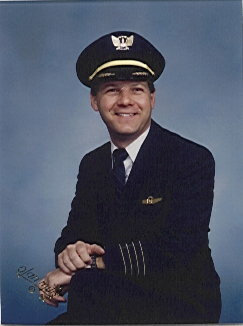 Ever since he was a young boy, growing up near a major Houston airport, Tommy Ondrasek wanted to be an airline pilot. Ondrasek graduated from high school in 2001, the year that 9/11 occurred. Instead of giving up on aviation, he became more passionate and desired even more to become a pilot. The 9/11 attacks also influenced his decision to defend his country. “I knew that I wanted to join the military prior to September 11th, but those events solidified my drive to do so,” he said. Almost a decade later, Ondrasek, a SJSU aviation operations student, became the recipient of the 2010 Captain Jason Dahl Scholarship. 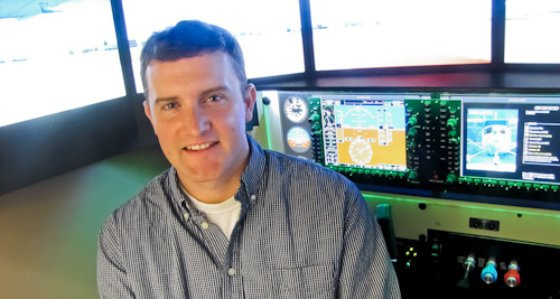 He used the $5,000 award toward flight training. Dahl, a 1980 SJSU alumnus, was the captain of hijacked United Airlines Flight 93, which crashed in a field near Shanksville, Pennsylvania. Passengers and crew members prevented the terrorists from completing their mission. The Captain Jason Dahl Scholarship Fund, a non-profit corporation founded by Dahl’s widow, Sandy, awards aviation college students with these scholarships. After enlisting with the Navy, Ondrasek was shipped out to boot camp on March 12, 2002. He served as an Aviation Electrician’s Mate at Naval Air Station Oceana in Virginia Beach, Virginia. “For my job, it was maintaining anything and everything electrical on an aircraft,” he said. After being honorably discharged in 2006, Ondrasek headed to California with his wife, who started graduate school at UC Berkeley. Meanwhile, he attended Diablo Valley College, where his career counselor introduced him to SJSU’s aviation program. After graduating, Ondrasek hopes to start off as a flight instructor and look for flight-related jobs. He wants to work his way up to become a pilot for a major airline, just like Dahl. While Ondrasek has earned other scholarships in the past, the Dahl Scholarship means the most to him. “I feel more of a need to push myself to achieve great things because of it,” Ondrasek said. 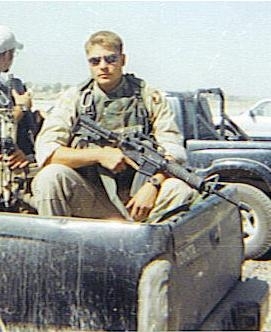 Justin Celano in the back of a Toyota Tacoma in Afghanistan. He bought the same make and model for his trip across country when he returned to the states after serving six months in the Middle East. Photo courtesy of Justin Celano. Now a University Police Department corporal, then a U.S. Army Ranger, Justin Celano was one of almost 2,000 soldiers deployed in early 2002 for what became known as Operation Anaconda. He seemed well prepared, having trained for a few years, since enlisting straight out of Santa Teresa High School, Class of 1999. But there were many lessons to be learned in Anaconda, including one directly affecting Celano, a sniper. Celano wound up earning a place in history after sharing his experiences with embedded Army Times reporter Sean Naylor, who penned “Not a Good Day to Die.” The New York Times bestseller is a detailed account of the operation told through the eyes of soldiers like Celano. When Celano returned to the United States, one of the first things he did was buy what he knew was one of the most reliable cars on the road, a Toyota Tacoma. “That’s what we were using over there, and they seemed to run forever with bullet holes in them,” he said. Celano and a cousin drove the truck across the country and back to San Jose, where a family friend told him UPD was hiring. Within a few months, he was on the job. He had just turned 22, making him younger than most SJSU students. “I looked at myself at 21, having been in the military, as years older than someone who was 21 and hadn’t been in the military,” he said. Now 30, Celano sold the truck a few years back. Married and expecting his first child in November, he is steadily climbing the ranks at UPD. Celano also remains modest and reserved. He doesn’t talk much about his military experience. 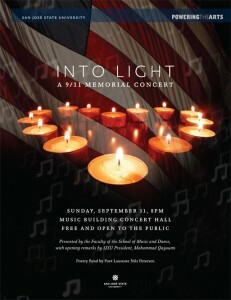 Into Light: A 9/11 Memorial Concert. Graphic by Ali Hanshaw. In remembrance of September 11, the School of Music and Dance is hosting a memorial concert that is free and open to the public. “Into Light: A 9/11 Memorial Concert” will take place on September 11 at 8 p.m. in the Music Building Concert Hall. Dr. William Meredith from the Beethoven Center approached professors Joseph Frank and Layna Chianakas about organizing the event, and they were happy to do it. They will also be performing. For the event, Frank, a tenor, chose to sing “America My Wondrous Land,” an award-winning song that recognizes the American spirit. “A perfect piece to honor the memory of our fallen citizens on 9/11,” Frank said. Frank had lived in New York for many years and performed at the Metropolitan Opera. He remembers the stress of trying to contact his friends there after the attacks on the World Trade Center’s Twin Towers. At the concert, Chianakas, a mezzo-soprano, will perform “Sometimes I Feel Like a Motherless Child,” an African-American spiritual. Many SJSU students were only children when the attacks happened, and Chianakas hopes that the event will allow them to experience the impact it had on the country. SJSU’s new President Mohammad Qayoumi will also provide opening remarks before the concert. “The past 10 years has been the time period for us to reflect and see what we have learned and how we can use this experience in a way that will strengthen us as a nation,” Qayoumi said. Other participants include the faculty of the School of Music and Dance; Nils Petersen, Santa Clara County’s first poet laureate and a SJSU professor emeritus; and SJSU’s Air Force ROTC Color Guard. The event will conclude with a candlelit vigil. SAN JOSE, Calif. (KGO) — The wife of one of the Sept. 11, 2001 heroes was in San Jose Friday to honor her husband, Captain Jason Dahl and help San Jose State University launch a new era for its aviation program. Sandy Dahl returned Friday to the place where her husband made his first solo flight when he was 15. “He did not have his drivers license so his father had to drive him out there to this very airfield and watch his son take off all by himself,” Dahl said. Captain Jason Dahl was at the helm of United Flight 93 when it crashed into a field in Shakesville, Pennsylvania. “When he came into prominence thought he disaster of September 11th, he became a figure head of many pilots of bravery and service,” SJSU Aviation Chair Seth Bates said. Friday, Sandy Dahl was an honored guest as San Jose State cut the ribbon on its new aviation facility at Reid-Hillview Airport. In addition to the hanger, the university has a new state of the art aviation lab on campus that includes a full motion simulator. There is a bronze plaque in the lab honoring Captain Dahl. Shortly after the Sept. 11 attacks, his wife set up a scholarship fund in his honor. Colton Thomas is one of the students who has applied. “It’s not a small thing to become a pilot, it’s work over a lot of years so you need diligence and passion,” Thomas said. For Sandy Dahl, the scholarship brings her husband’s life and sacrifice full circle. “We will go forward and will fly and we will have good pilots and we will have the freedom to do so,” she said. 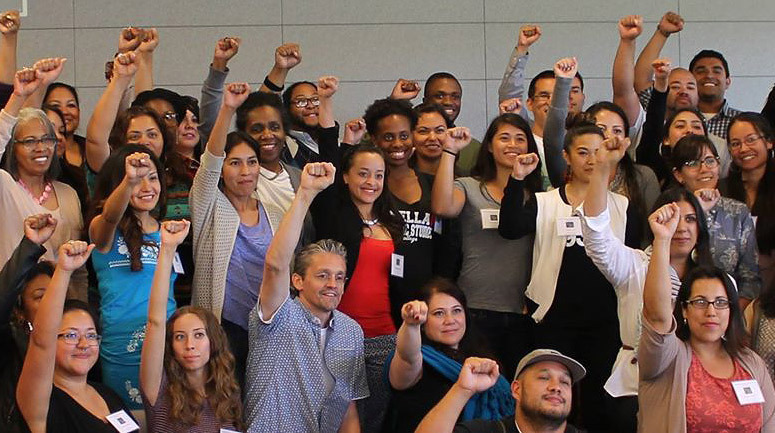 The latest round of scholarship recipients will be announced next month. 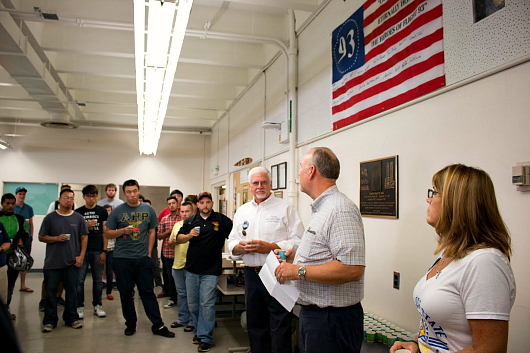 San Jose State University has found a new home for its aeronautics program at Reid-Hillview Airport. For the past 50 years, the university has been leasing space from Mineta San Jose International Airport to train students for careers in aviation, airline maintenance, administration and technology. In December, however, the university was notified that it could not longer occupy the building, which it built in 1960, for the below-market rate of $2,500 a year. The cash-strapped airport believes the site could rent for $1 million annually based on recent rent appraisals. So officials at Reid-Hillview in San Jose went to work to find a site for the students. The Santa Clara County Board of Supervisors said on Wednesday that the county agreed to lease a 6,000-square-foot facility for $3,125 a month that will be paid to the County’s Airport Enterprise Fund. The new facility on Swift Avenue includes a 5,000-square-foot hangar and an 860-square-foot office space. The hangar will house several aircraft and engines used to teach students. No flights are associated with the Aeronautics Program. “Leasing the Reid Hillview Airport property to San Jose State University will bring extra revenue to the County and keep impacts to the community at a minimal level,” said Supervisor Dave Cortese, District 3, in a statement. Cortese, who helped bring the two organizations together, said he was glad to help further the university’s academic mission.